It is well known that Rhodia is my favorite fountain pen friendly paper. I primarily use the Rhodia DotPad in the medium and large sizes, and they have proven to be very consistent and receptive to various inks as seen in my many fountain pen ink reviews. The DotPad and other similar 80 g paper Rhodia products are the standard you find at stores and online, but they branched out into the premium paper market a couple of years ago with the Rhodia R Premium line. JetPens has started to stock this line and I got my hands on one to review. 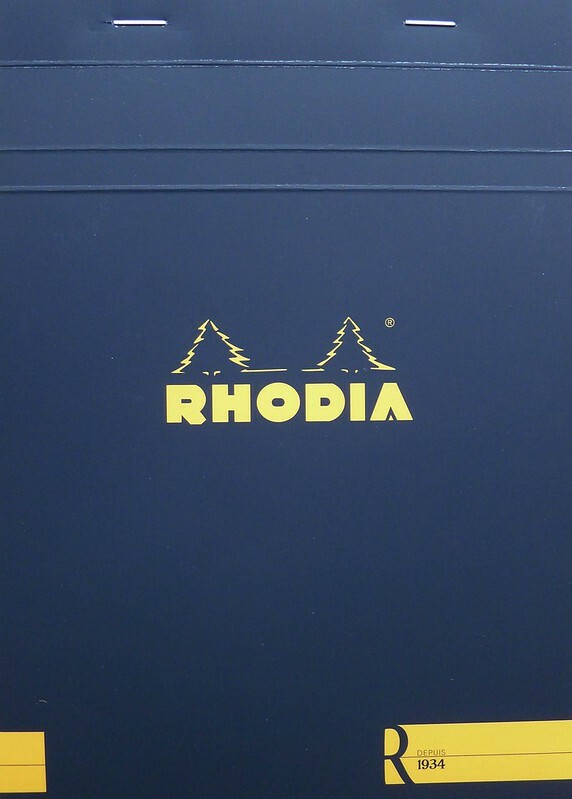 Being as familiar with Rhodia's traditional offerings as I am, I noticed several differences immediately upon opening the package. First off, the cover has a different feel to it. Most Rhodia products have a glossy coated cover, while the R uses what they call a "Soft Touch" coated cover. It has a satin-like feel and the black cover attracts fingerprints like a mother. Not a big deal unless you are eating a cheeseburger and throwing your pad around like a frisbee at the same time, but I thought I would point it out since my fingerprints were the first mark on this pad, not ink from a pen. Cover issues aside, the paper is obviously the star here. Despite being only 70 sheets, the 90 g ivory-toned paper was noticeable heavier and denser than its 80 g counterparts, as it should be. "Soft Touch" should be used to describe the paper instead of the cover because that was my reaction when first feeling it. Calling it smooth would be selling it short. I'm not sure I've felt anything like this before. That smoothness carried over to every pen I tested, from the widest nib fountain pen to the finest ballpoint. All performed flawlessly. If there is one hangup it is the ink dry time. I thought my DotPads took a while - the R is extreme. 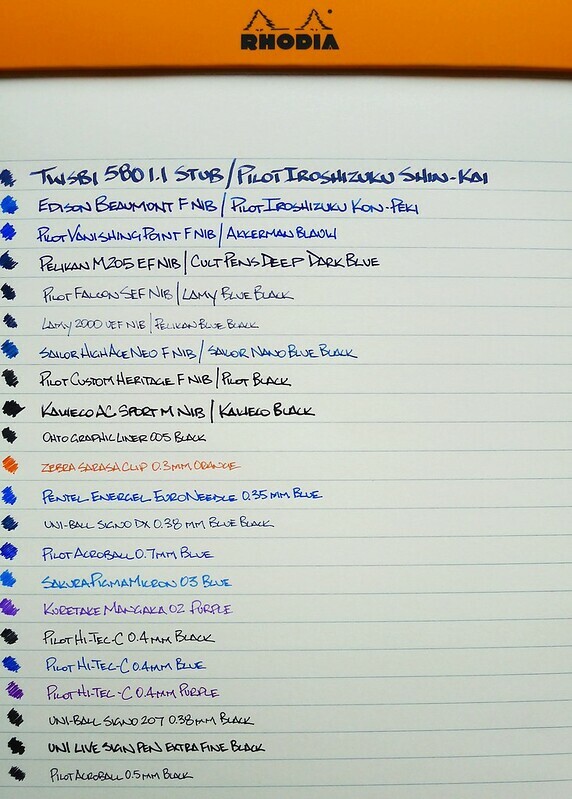 Fountain pen ink glistens on the surface for quite some time, so lefties beware. Despite that, there was no feathering, bleed, or show through to the back of the page to speak of, which is an impressive feat. 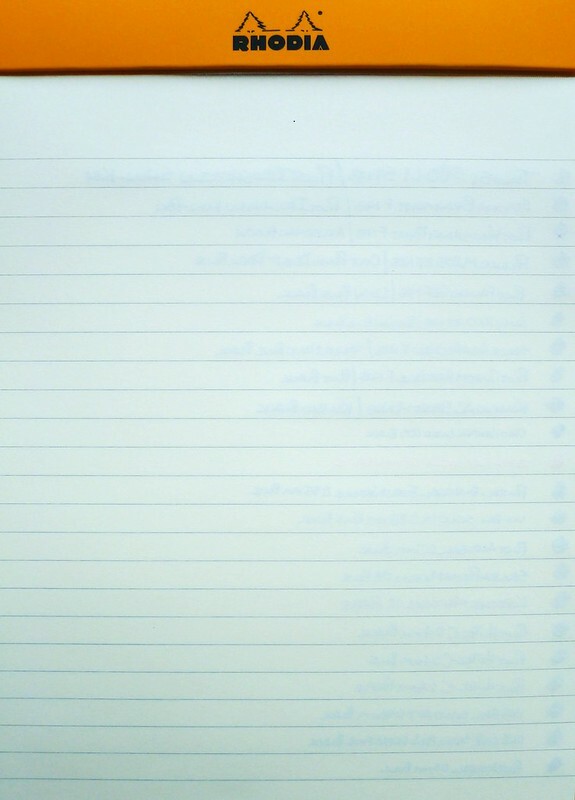 So what would make the R by Rhodia my go-to fountain pen pad over the DotPad? White paper for starters. It used to not bother me so much with traditional pens but now that I am into fountain pen inks I find that it skews the colors too much for my liking. Secondly, add a grid or dot grid option. Lined and blank are my two least favorite and least used paper options. Rhodia makes great grid paper - why not mix one in? Overall, this is fantastic paper. It is priced at a premium compared to the standard line, and the premium features are noticeable. Will it surpass the DotPad as my number one fountain pen paper? Not right now, but if any changes get implemented in the future I will be taking another look. Posted on September 26, 2013 by Brad Dowdy and filed under Notebook Reviews, Rhodia.